On Saturday May 5, 2018, Bosnian Americans and friends of Bosnia and Herzegovina (BiH) gathered in Washington, D.C. to pay tribute to those who have sacrificed and dedicated their lives for Bosnian statehood, celebrating its 75th anniversary this year. "Bosnia regained its statehood in 1943 as a country with one of the strongest, if not the strongest, anti-fascist movements in Nazi-occupied Europe. Our statehood was reborn through bloody struggle of Bosnians of all political persuasions within the People's Liberation Movement led by Tito. One of the greatest achievements of Bosnian nation is that we were one of the very few nations in Europe not to be liberated from Nazism by the Allied forces. We liberated ourselves. Again, in the 1990s we managed to defend ourselves against overwhelming odds. However, I believe that the lowest common denominator of Bosnian history is tolerance of the other. That is why I believe that us Bosnians became such good and proud Americans today," stated ACBH President Ajla Delkic. 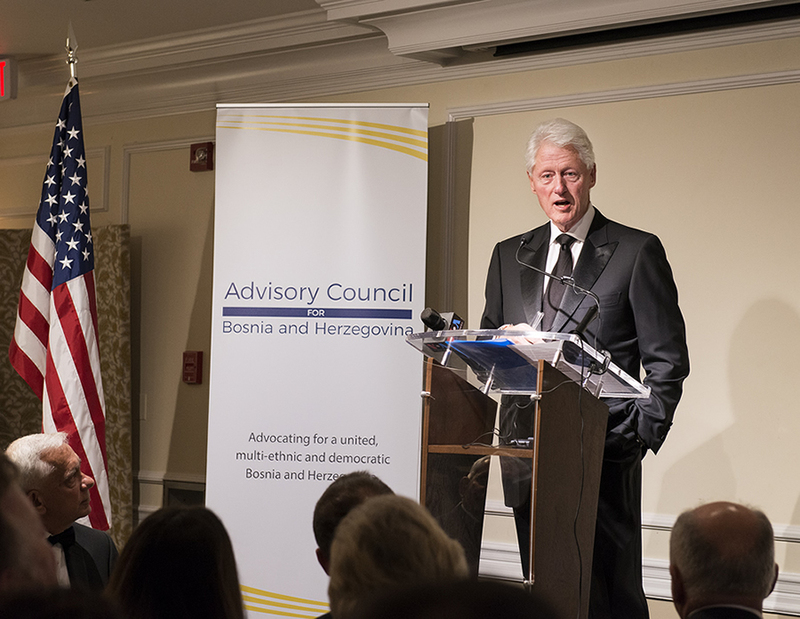 The keynote address was delivered by the 42nd President of the United States of America Bill Clinton who was honored with the ACBH Lifetime Achievement Award for his role in stopping the war of aggression against BiH. 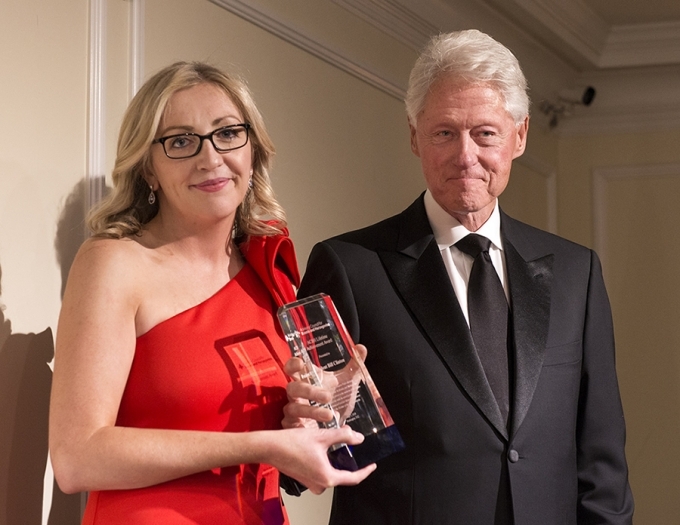 During his speech, President Clinton expressed gratitude for the award stating: "I actually don't believe that former presidents should get honors. I thought always the job was honor enough, but this is something I am glad to take advantage of. The opportunities that I and the people with whom I had the honor to work had to try to end the genocide in Bosnia and make a new beginning, was one of the most important things that ever happened to me, not just as President, but in my life." He went on to say that "nobody thought that the Dayton Accords was perfect. It obviously set up the possibility of paralysis." ACBH also honored General Wesley Clark, Ret., with an ACBH Outstanding Military Service Award for his valor, and contribution to BiH's peace and stability. As the former NATO supreme allied commander, General Clark is one of the most decorated military heroes of our time who helped achieve the peace agreement that still endures to this day in BiH in the Dayton Peace Accords. He went on to command Operation Allied Force, NATO's first major combat action in the former Yugoslavia in the Spring of 1999, that drove NATO to victory against Serb forces trying to continue ethnic cleansing in Kosovo. The ACBH Philanthropy Award was presented to Bosnian entrepreneur and humanitarian Sanela Diana Jenkins. As one of the most successful and recognizable Bosnians, Ms. Jenkins has dedicated a lot of time and resources to the advancement of justice and BiH's progress and development. She spoke poignantly about being a refugee girl in London during the war in BiH where she lost everything, including her younger brother Irnis, and how she overcame all odds to become an accomplished entrepreneur and a widely respected unwavering voice for peace and justice. "Twenty six years and one month ago today began the siege of Sarajevo, the longest siege of a capital city in the history of modern warfare in which over 11,000 people were killed! Sadly, Sarajevo, one of Europe's most beautiful cities, remains mine-affected today. We would like to help render the capital city of Sarajevo free of mines in time to commemorate the 25th anniversary of the end of the war. It would be wonderful if like minded friends of Bosnia could help us achieve this objective. Please go to our website and join us in supporting a mine-free Sarajevo by the fall of 2020," stated General Sullivan. The ACBH Bosnia and Herzegovina Friendship Award was presented to longstanding friend of BiH and Bosnian Americans, filmmaker and author Bill Carter for his tireless commitment to human rights and the brave humanitarian actions that he undertook during the war in BiH. Mr. Carter spoke about connecting everyday Bosnians during the Siege of Sarajevo to the rest of Europe with the help of Bono and the band U2 via satellite during their concerts. He spoke about the perseverance of Bosnians who were grappling with the insurmountable challenges of war, and the lessons they can teach us today. ACBH honored U.S. Army Captain Ermin Mujezinovic with the ACBH Public Service Award for his selfless service to our nation. In his speech, Captain Mujezinovic spoke about growing up in a small village between Zenica and Vitez and losing everything in the war, especially the ability to run free as a child, as the area was ridden with landmines. He spoke about the strength of the mothers of Srebrenica, and the importance of standing up for what is right and for those who cannot stand up for themselves. Next, ACBH was proud to honor the Hastor Foundation with the ACBH Community Service Award. Set up by the family Hastor, this charitable organization supports and empowers 1860 children and young people in over 115 municipalities in BiH. The Hastor Foundation is contributing to the development of a new cadre of self-conscious leaders in their communities and the entire country. Since 2006, scholars receive a monthly scholarship that is often the only source of income for their families living in extremely deprived economic situations. 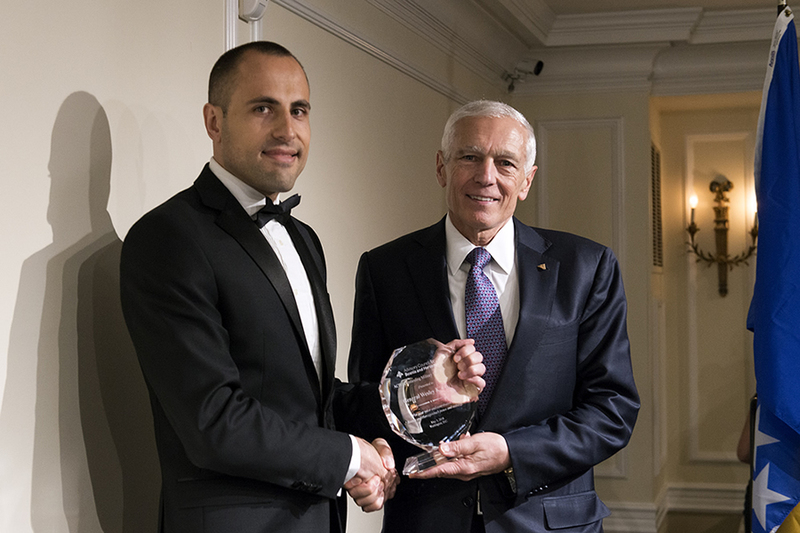 Almir Jazvin, a long-standing volunteer at the Foundation, accepted the award on behalf of the Hastor Foundation. 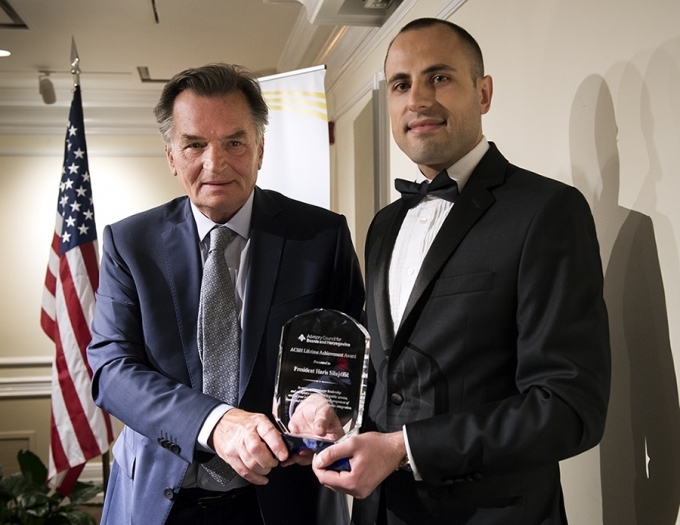 The evening concluded with ACBH honoring former BiH President Dr. Haris Silajdzic with the ACBH Lifetime Achievement Award for his leadership and exemplary commitment to public service, and for being a strong proponent of BiH's Euro-Atlantic integration. Between 1990 and 2010, President Silajdzic held multiple leadership posts in the BiH government, including serving as Foreign Minister and Prime Minister during the incredibly challenging years of the war of aggression against BiH. 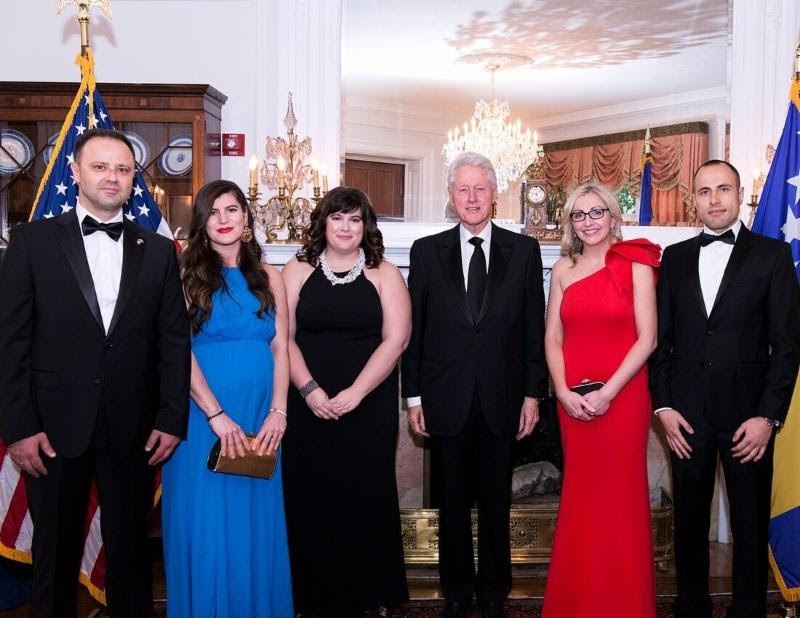 During his speech, President Silajdzic thanked President Clinton, the people of the United States, and noted his longtime friend U.S. Senator Bob Dole (R-KS), for the role they played in stopping the war in BiH. He went on to say that "[i]f this country, the United States, does not protect this Dayton Agreement and reform it, it will never happen. Without the United States of America, it will not happen, and the Balkans will stay under tension." 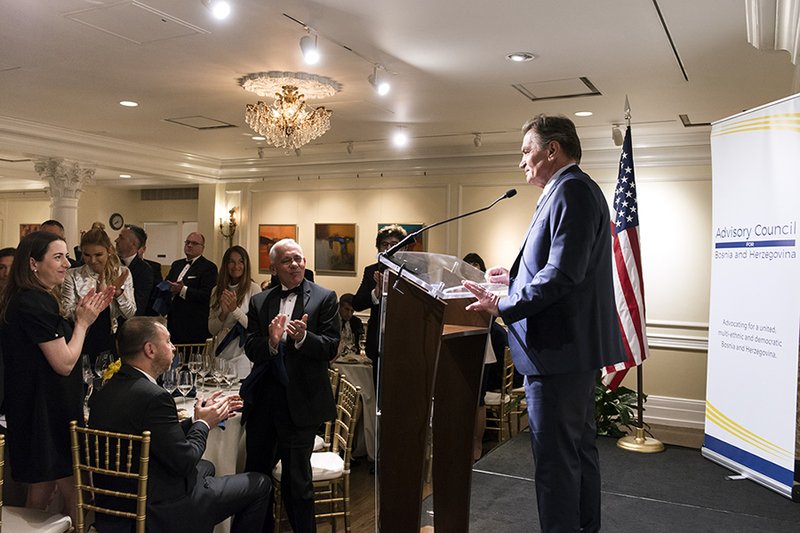 ACBH is deeply grateful to our gala co-chairs, His Excellency, Ambassador Haris Hrle, Bosnia and Herzegovina's Ambassador to the U.S., Congresswoman Eddie Bernice Johnson (D-TX-30th), co-chair of the Congressional Caucus on Bosnia in U.S. Congress, as well as our gala host committee members Elvir Klempic, Senada Cvrk-Pargan and Vildana Bijedic. Further, ACBH would like to sincerely thank all of our sponsors, guests, and volunteers for making this gala a memorable evening including, Searchkey, TAZ Trucking, Turkish Coalition of America, Authority Partners, Intuitiva NYC, Chicago Health Medical Group, Houchens Insurance Group, and the Dayton Delegation. Gala silent auction items included a signed soccer jersey by BiH soccer player Asmir Begovic, painting by Bosnian American artist Ferid Sefer, a painting by Bosnian artist Hasija Music, BiH wines courtesy of Wines of Illyria, and signed copies of the book Skyglow by Bosnian American artist Harun Mehmedinovic. Lastly, thank you to Edin Maslesa, CEO of Fall River Florist Supply, for providing the beautiful lilies for the gala.